Hungry for God: Is It Wrong to Pray for "Little" Needs When Others Have Big Ones? Is It Wrong to Pray for "Little" Needs When Others Have Big Ones? I’ve known of Sister Freda for years through friends. A soft-spoken, regal Kenyan, she’s a woman with big dreams – dreams that are coming true. Since 2004, when she left her job as a nurse, she’s served the poorest and sickest citizens of Kitale, Kenya. She’s founded a hospital, an outreach clinic, a preschool, a feeding program, a girls school, and a nursing college. When my friend Debbie, who’s taken several mission trips to Sister Freda’s hospital, got married recently, Sister Freda came from Kenya to be her maid of honor. Because I knew she was a powerful prayer warrior, I asked her to pray my book would find favor with a publisher. Then I asked how I could pray for her. Her response made my heart hurt. That’s when I felt small – asking her to pray for my book project when she was trying to feed children and save lives. 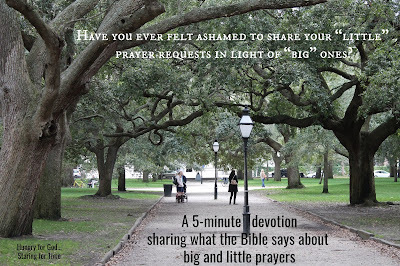 Have you ever felt ashamed to share your “little” prayer requests in light of “big” ones? I mean, what’s a devotional book compared to hungry children and sick Kenyans? What’s a better job compared to cancer? Or a tight budget compared to a family member addicted to cocaine? Or the loss of a pet compared to the loss of a spouse? What right do we have to pray (or ask for prayer) for our own small needs when others are facing life-threatening, earth-shattering events? After much wrestling and soul-searching, I can confidently say we have every right. 1. God is able to hear ALL our prayers. “Surely the arm of the LORD is not too short to save, nor his ear too dull to hear,” Isaiah 59:1 assures us. My “small” prayers don’t prevent God from hearing Sister Freda’s “big” prayers. I often told my children, “I may have two ears, but I only have one brain. Talk to me one at a time.” Thankfully, God isn’t limited by human frailties. He hears the cries of all his children and responds even before we say “Amen.” “Before they call I will answer;” he promises, “while they are still speaking I will hear” (Isa. 65:24). 2. All our requests are small in light of God’s power. Unlike us, God doesn’t rank needs on a scale of difficulty. Curing cancer is just as easy for him as providing money for school books. His power is beyond measure and miracles are his specialty. “Is anything too hard for the LORD?” God asked Abraham when Abraham laughed at the promise that his 90-year-old wife would have a child. This same truth levels the playing field for our prayer requests. 3. God’s resources aren’t limited. I remember as a teenager asking my mom for a pair of jeans. “I can’t buy them this month,” she said. “Your sister needs a winter coat.” Money was limited in our one-income family, so she had to prioritize our family’s needs. The greater need got the yes. The lesser need had to wait. In God’s economy there are enough resources for every need. I don’t have to worry that a child will go without clothing in Venezuela if I ask God for money to buy my husband a birthday present. 4. God calls us to different ministries and cares about each one’s success. Sister Freda’s calling to save lives, feed orphans, and train women is remarkable. Equally remarkable is my calling to write. Because God uses both our callings to point people to himself, one ministry isn’t more important than the other. They both have a part in God’s great plan. Since that heart-baring conversation at my friend’s wedding, it’s been my privilege to pray for food and medicine for Sister Freda’s ministry. 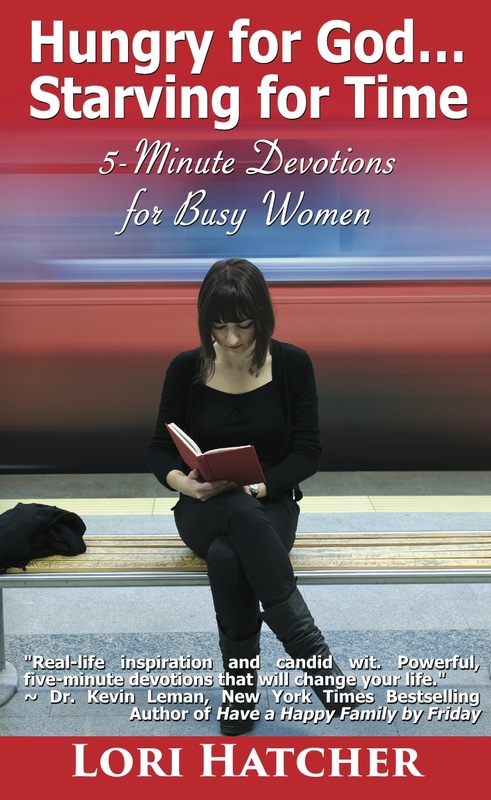 I’m confident she feels equally-committed to pray for my book. Together we’re doing our best to fulfill the calling God has placed upon our lives. As we pray for each other, we partner with God to accomplish his will and work in the world. And that’s nothing to feel ashamed about. 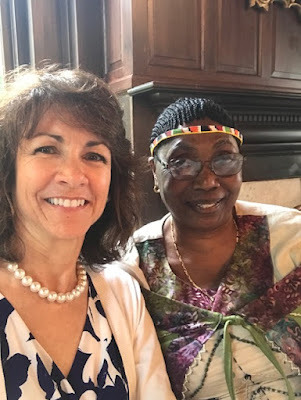 If you'd like to learn more about Sister Freda's amazing ministry to the people of Kitale, Kenya, click HERE. Many thanks to fellow blogger Sheryl Boldt, whose post, "Praying for Our Needs when Others Are Dealing with Far Worse," prompted me to further explore this topic. Would you like to win a FREE COPY of the audio version of my book, Hungry for God ... Starving for Time? CLICK HERE.